Do you think that you can use a new coil right about now? Then say no more! Of course, you know that Smok is going to have you covered. This brand has been creating several different vaping products like crazy, which is why you can depend on them because of the knowledge they bring to the table. The TFV12 Prince Max Mesh Coil is going to be one that you might consider getting after you find out what it can do for you. It is sad to realize that your current coil has burned out and now you have to get a new. However, this new coil is going to tell you that stressing over something like that should not be a huge issue. This coil is going to have a resistance of 0.17ohm and a recommended Wattage Range of 70W to 130W. The coils are going to be long lasting and durable so that you do not have to worry too much about one of them losing its touch anytime soon. Good news is that this coil comes in packs of three, and seem as if they are always going to be there to take you on an amazing vape trip. 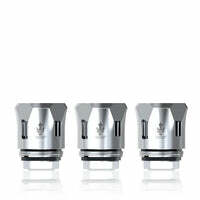 TFV12 Prince Max Mesh Coil - Smok has a rating of 4.8 stars based on 5 reviews.